She finally arrived! 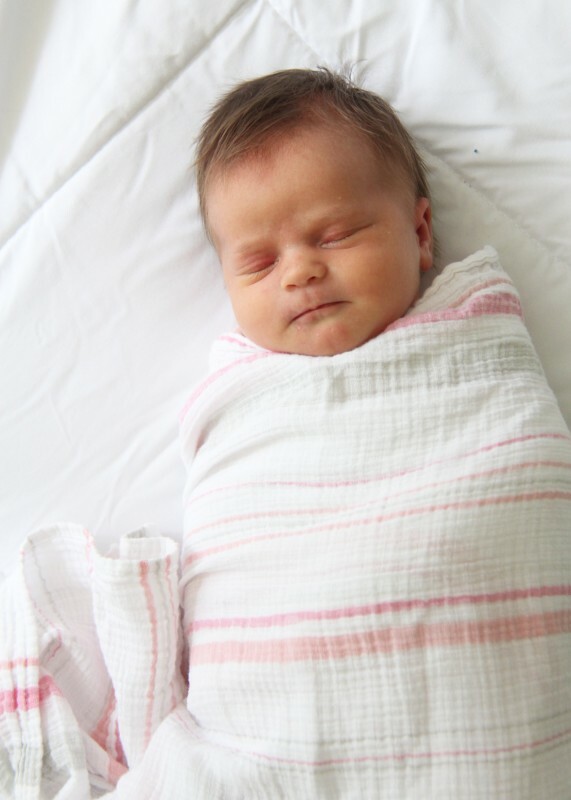 Jane Louise Harris was born Friday…and we are loving every minute of her. I was pregnant with her a good 10 days longer than with my other kids…and she was a healthy 9 pounds 4 ounces because of it! I was induced Thursday because of hypertension, which ended up being a blessing in disguise. For some reason I barely felt any pain until I was already 8 cm dilated, and she was born just a half an hour or so after…so if I hadn’t been induced chances are I would have had her at home/in the car! She’s as sweet as they come, and even has let me get plenty of sleep this past week while I heal. Sophie is over the moon excited to have a baby sister…and very “helpful”. I’ve had to watch baby like a hawk so Sophie won’t pick her up without me…but so far she’s been good with her and is following the baby “rules”. What a beautiful, perfect baby. Congratulation to you and your family. Congratulations. She is absolutely gorgeous. She is absolutely beautiful. God Bless your entire family at this joyous time. And happy sewing again to you. So so pretty! Congratulations and enjoy that sweet girl!! What beautiful little girl! Congratulations! Oh bless, she is just so beautiful. All that hair and so sweet. I’m glad you are getting enough sleep and she has fitted so well into your family. Babies are wonderful. Congratulations. She is beautiful – congratulations! She is absolutely gorgeous!!! Congratulations!!! What a sweetie!! I love your Mommies helper too, I can tell she is loving being a *big* sis already. Congrats to you and your family! Congratulations on your most beautiful baby girl. The photos are gorgeous. She’s just precious! So happy for you and the family! Congrats! Jane is so beautiful, such a little darling to let you sew, definitely a quilter in the making at a very young age! Congrats Allison. I love the name Jane Louise…. Beautiful baby girl! Congratulations… I’m happy both of you are ok. She is really pretty… hope you show her soon again. She is beautiful Allison! And looks at that sweet Sophie with her. Congratulations to you and your husband! What a charming addition to your family. Your photos are delightful! Do I sound repetitive saying she’s beautiful? LOL She is just precious…what a sweet little face!! Congratulations on a safe delivery and new addition to your family. So happy for you! What a beautiful little darling. I have a little Jane too (she’s nearly three), so I must compliment you on your choice of name! Hope you get all the help you need and can rest when you need it, and I really hope you can continue to find a bit of time to sew so you get some mental space for yourself! Oh, she is such a cute beauty! All the best for you and your family! Thank you for letting us know! I’ve been wondering. Many, many, blessing to you and your family. Congratulations on your gorgeous new arrival. Looking forward to to seeing what quilt you make for her. With very best wishes from York, England. Absolutely gorgeous as is your older daughter. Sending warm wishes to the entire family. Congratulations!!! She is PERFECT! Absolutely darling! I love her name too (my middle name is Jane). She looks so content! You’ve been blessed! Congratulations, a new little quilter in training. Precious!! Thank you for sharing. All the best! She is adorable, congratulations Allison and family !! I wish you all the best ! Congratulations! The photo with Sophie holding her is so sweet!!! Jane is so beautiful! God Bless you and your family! Congratulations! What a lovely babygirl! What a beautiful baby with such a pretty head of hair. Congratulations to your family!! She is a darling. Congratulations and enjoy! Allison, she – they – are simply divine. Many blessings to you and your family. And sewing after 6 days! What are you making? Congratulations for your beautiful family ! Congratulations! And what a beautiful girl! Time may have been slow for you but I read the mail and thought “Already?” Wow! Time flies. So happy for you. Congratulations! Such a pretty little girl! What a gorgeous new little person Jane is. Congratulations! Congratulations! She is beautiful. So thankful all went well. She is so beautiful & so big! So happy for you all! God is good! Congratulations to your family, what a blessing. The photos with family members are beautiful. Congratulations! You have the prettiest babies! Makes me smile! She truly is beautiful! So happy for you! Congratulations! She’s beautiful. I love that she looks like she is smiling while Sophie is holding her! My best wishes to you and your family on her arriva. She’s beautiful and so is big sister. Such a beautiful little girl! Congratulations! Félicitations ! Magnifique bébé. Bon rétablissement. Precious – especially the pic of the two girls! Congrats to your family!!! Congratulations on your healthy beautiful girl!! I’m so happy for you all, and glad things went so smoothly. Baby Jane is beautiful. Congratulations! She’s adorable. So glad all went well with the delivery and you didn’t have to deliver in the car! Get rest while she will let you. Congratulations – I’m so happy for you and your family. Healthy, happy and so beautiful. Good fortune and much happiness to Jane and the entire Harris family. Congratulations! She has your husband’s smile when you look at the last picture of Jane. Love her name! I’m so happy for you! What a beautiful family ! Congrats to all ! Congratulations, Allison! She is obviously the perfect addition to your family! Your pictures are so lovely – you are very kind to share them with your online quilting groupies! Continued blessings to you all. Congratulations, she’s beautiful. Gos bless your little family. Congratulations! She is beautiful! Glad everything went well. Congratulations! She’s gorgeous & I love her name! Congratulations! She is so beautiful. I saw your post on Instagram and loved the picture. Blessings to all of your family. I’m so happy for you. She’s beautiful!! What a beautiful baby girl. Best wishes to all of you. Perfection in one little package!!! She is just beautiful. Precious!! Best Wishes and Congratulations to you and your beautiful family!! Congratulations on your sweet little one to you and your whole family. That extra time made her extra beautiful. I love her name, Jane was my mother’s name. Sweet blessings to you and your family. She’s just beautiful and she looks like her daddy. Congratulations to you all. She is so beautiful! Congratulations to you and your family! She is beautiful. Congratulations to all. She is beautiful and look at all that hair! A precious addition to your beautiful family. Congratulations! Absolutely precious!!! Congrats to you and your family. What a little angel!!! Congratulations! What’s not to love? Every picture oozes with love and beauty! Yay! Congrats! She’s adorable! Enjoy that sweet little baby. Allison! She’s absolutely beautiful!!! Congrats to you all. What do big brother’s think about her? what a sweet little package of love! Congratulations! Your family has one more beautiful blessing! Congratulations on your precious little one! She’s beautiful! Sweet Jane! Congratulations to you all and she is fantastically angelic. Congratulations, she is so beautiful, enjoy. Congratulations….she is beautiful. I am a retired Labor and Delivery nurse (40 years) so I totally understand being overdue. Each day feels like forever, but they are so worth it!! Congratulations! I’m happy to see you and baby are doing well! She’s so healthy and beautiful!!! Congratulations. Jane is just so beautiful. I am sure that you are all enjoying her. 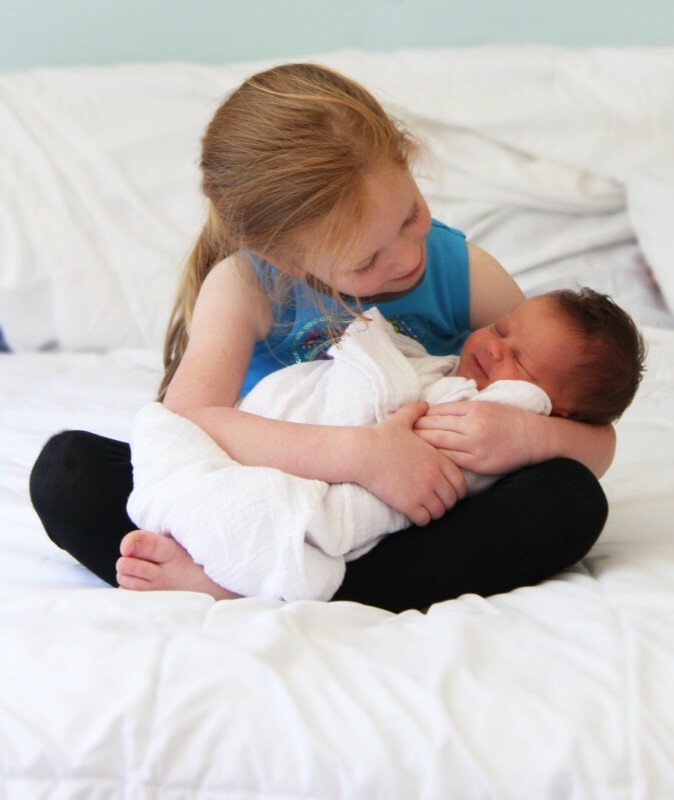 It looks as if Sophie is going to be a wonderful big sister. Hugs.. 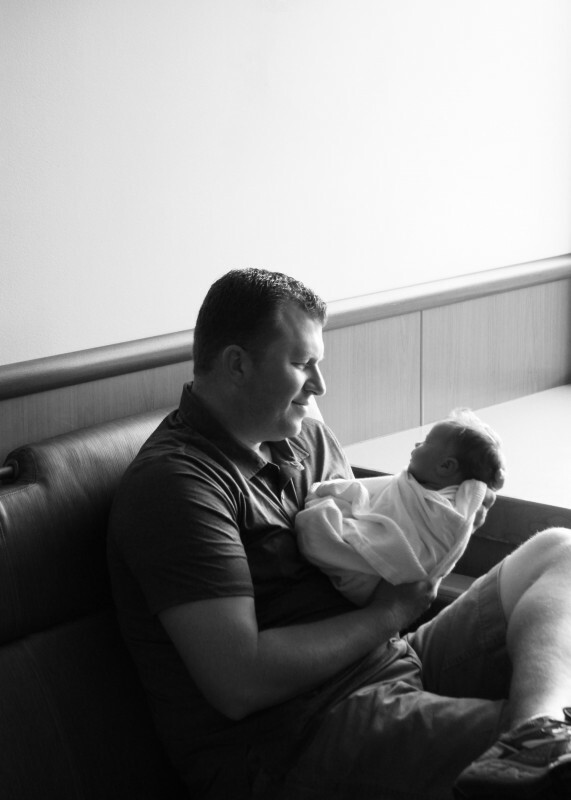 Thanks for sharing photos of your precious family, and the new baby that proves good things come to those who wait. So happy for you that she is here, safe and sound, and look forward to your new sewing times when they happen. Spend those moments snuggling while you can! All too soon she will be past that. Congratulations on all the new love coming into your family and all of your lives. 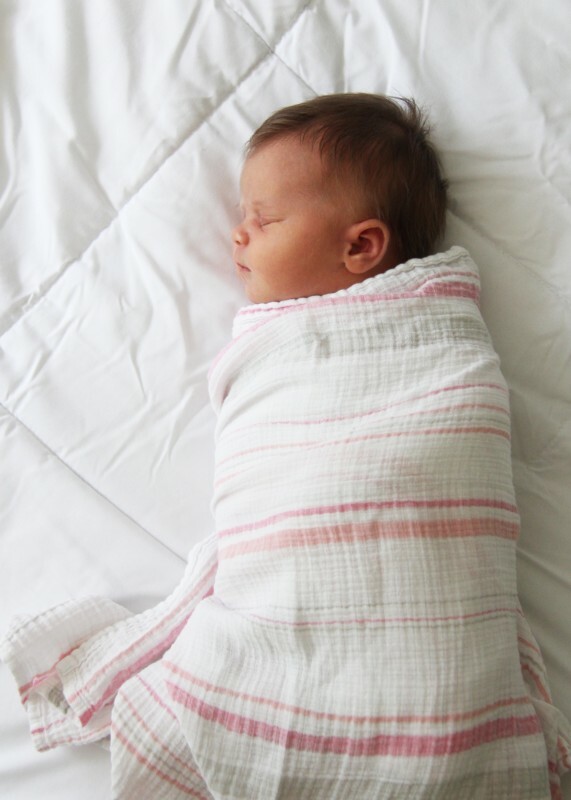 New borns are usually kind of ugly, but Jane Louise is really a cutie – a precious bundle of joy. Congratulations! thanks for sharing family photos, baby Jane is adorable and so is her beautiful sister holding her how sweet, you have a lovely family!!. Both yor girls…so sweet! All that hair! Beautiful! Two beautiful girls–how wonderful! Sometimes babies who “cook longer” are healthier so glad she took her time. All four of my grandchildren were premature and it can be pretty scary! Best wishes to your lovely family! Congratulations! She’s so perfect (they both are, actually). She is just beautiful! I love the name you’ve chosen. Congratulations! 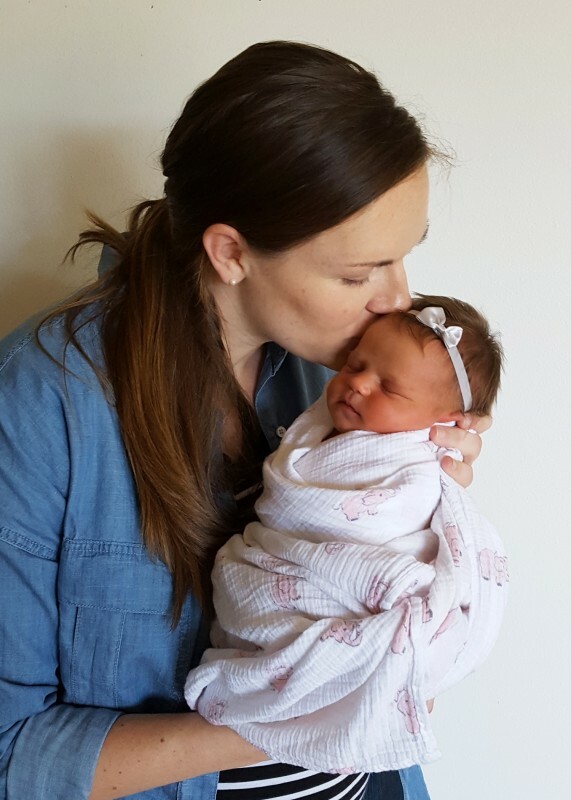 Nothing like a new baby – she is so sweet. Love the pics of her and her big sister! Enjoy your new bundle of joy! Absolutely beautiful. You are BLESSED! Baby Jane is precious! Hugs to you and your beautiful family! Blessings abound! Congratulations….I love big sister’s instant LUV! Sweet baby girl- congrats to you! Welcome to the world baby Jane Louise Harris! congratulations – she is beautiful. Awwwwwwwwww, she is just the cutest little girl. Well, maybe not so little but really cute. Congratulations. Such a pretty baby! Your daughters are beautiful! Congratulations! Congratulations! Gorgeous baby and family! She was so worth the wait!!!! Congratulations!! What a precious new baby girl to go with her precious sister and brothers!!! Just lovely!! and such sweet parents from the pictures. Take care and God bless Jane Louise and all of her family !! Your little one is beautiful. Congratulations to you and your husband and big sister. Been thinking about you! She’s beautiful, Allison!! Congratulations! She is beautiful! You have large babies like me, mine were all in the 9lb range. Enjoy not being pregnant anymore and that new baby!!! congrats on your wee noodle!! so adorbs! Congratulations! What a beautiful girl! We heard the news from your parents who are proud as punch. Oh my! What a beautiful post! So vey happy for you all! She is a beautiful baby! Such a precious face!! She is so lovely!! Congratulations! :-) I was waiting for this post :-) You are wonderful mother! Lots of love for you and yours family!! She’s gorgeous – and looks so sweet. Im impressed that you are already back to sewing! You go, girl! Now that’s a pretty baby! Congratulations. Congratulations, she is adorable! What a head of hair! She is just beautiful. And that hair! Congratulations, some things are worth waiting for. Both your girls are adorable. What a cutie! So happy for you. Sew SWEET! So happy for you and the family. Love the sweet hair, I remember the feel of it and the wonderful smell of their skin. You are BLESSED! Congratulations! She’s just gorgeous! What a beautiful addition to your lovely family! Congratulations! She is beautiful. So sweet! What a precious beauty! I’m glad you are on the mend.